Modern is more than architecture - it’s a lifestyle. Design industry experts and modern homeowners provide invaluable commentary and information on design trends, tips and more. This is Living Modern. Nestled in the heart of the busy city of Atlanta, the modern home of Kelly and Jeff Kingsfield is a hidden gem surrounded by nature. The couple discovered the property during one of their many visits to a nearby bird preserve, where Jeff indulged in his passion for bird-watching. “We were solely motivated to make this our home because my husband wanted to live near the bird preserve,” Kelly Kingsfield said. Now, they don’t have to go any further than one of the home’s many windows to see a huge variety of birds and other wildlife. “It’s amazing to wake up in the morning. All of those windows, you feel like you’re part of nature,” she stated. While its setting seems secluded, the Kingsfields’ home is within walking distance of restaurants and shops. They couple loves both its location and its modern style. “Living in this modern home, I have never felt hipper or cooler in my entire life,” Kelly Kingsfield said. When the Kingsfields found their house, it had already been framed. However, they were still able to add their personal style to it, designing its interior and exterior finishes. If they’d decided to stick with the architect’s original plans, their home would have been completely covered in white stucco. But that wasn’t quite the vision the couple had for their home. “So, Jeff and I changed that plan. We went with a modern black brick on foundation walls on the bottom part of the house,” Kelly Kingsfield said. They also wanted to include more wood than the original plans featured. “We added more of the wood element because we wanted to warm the house up and create more visual interest,” Kelly Kingsfield said. As the couple looked for building materials, they had a specific shopping list. “We researched to find wood options for the exterior of the house that would give us the warmth we were looking for, but over time would not warp, shrink, expand and would not require a tremendous amount of maintenance and that would not fade,” Kelly Kingsfield said. Though the couple loves birds, they also wanted to avoid attracting woodpeckers to their home. “We really could not find a single option of wood that we felt would achieve those objectives,” Kelly Kingsfield said. Through her job at an Atlanta homebuilder, Kelly found out about Nichiha as a wood siding alternative. “I’m so glad that we came across it because I think it was just the perfect product, with look and the warmth and the low maintenance. Since it’s a long-term product, it is not going to look bad as it weathers,” she said. Using a certified Nichiha installer made the process of adding the product to their home much easier, according to Kelly. And she loves the way the house turned out. The look of the house even inspired the couple to clear some clutter from their lives. “There are no knickknacks. We simplified when we moved into this home. We are both better housekeepers and a lot neater as a result of clean lines,” Kelly Kingsfield said. While they might not have quite as many possessions as they did before they moved, the Kingsfields do have it all – a beautiful modern home in a natural setting that’s still close to all the amenities of the city. “The location is an unbelievable wonderful combination,” Kelly Kingsfield said. When builders Arash Askarian and his wife Sherry, of Noura Homes , first found the property on Leyland Street in West Vancouver where they would design and build an ultra-modern, chic abode, it was inhabited by a neglected home overrun by the underbrush and vegetation surrounding it. While many would have dismissed the property, Arash and Sherry saw something different. They saw a structure not overcome by nature – but co-existing with it. Although the original home had to be removed, it inspired the couple to design a home that honored the landscape that it was part of. Trim is a common part of home exteriors, often used for edging windows, corners, doors, fascia board and soffits. 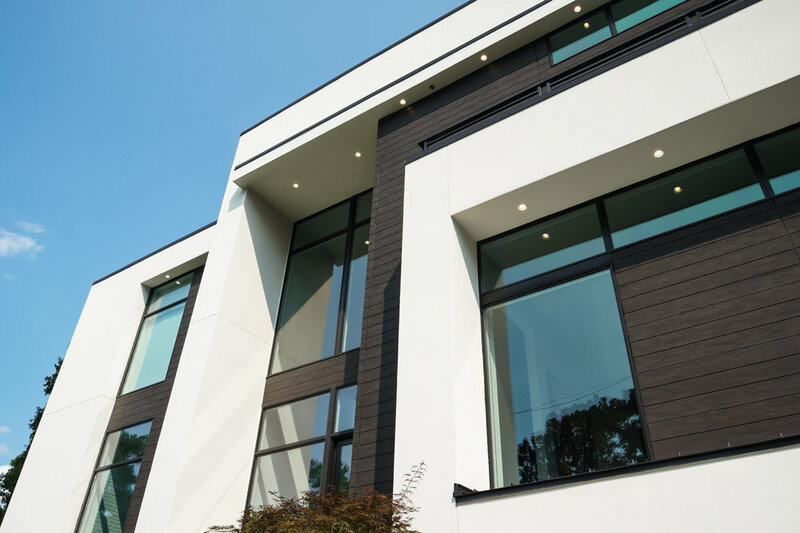 With modern home design, trim is essential to achieve the iconic clean lines that modern is known for, but it also has the ability to push aesthetic boundaries. We sat down with TAMLYN’s Ian Daniels, Technical Manager, XtremeTrim(R), to get his thoughts on uses of trim to elevate modern design, as well as trends. We recently spent time with California homeowner Sasaki Momoe and discussed the dramatic transformation of her traditional Bay Area home from ranch-style to Asian-influenced gem. Nichiha’s Empire Block panels were used in both the interior and the exterior of the home. We met up with homeowner Beverly to discuss why she decided to renovate her home to a modern design aesthetic.